The greatest part of the private library of professor David Bierens de Haan (1822-1895), professor of mathematics 1863-1892, was bequeathed at the end of the nineteenth century to the Leiden University Library. One of the collections was called the Bibliotheca Mathematica, comprising 56 portfolios, each of which containing dozens of smaller publications, mainly in the field of mathematics, sciences and technique. The collection, consisting of 24 portfolios in quarto and 32 in octavo, with in total 1741 titles, was until recently not catalogued, and for that reason neither searchable nor readily available. Most articles date from the nineteenth century, but there are also publications from the eighteenth and some rare specimens of the seventeenth century. 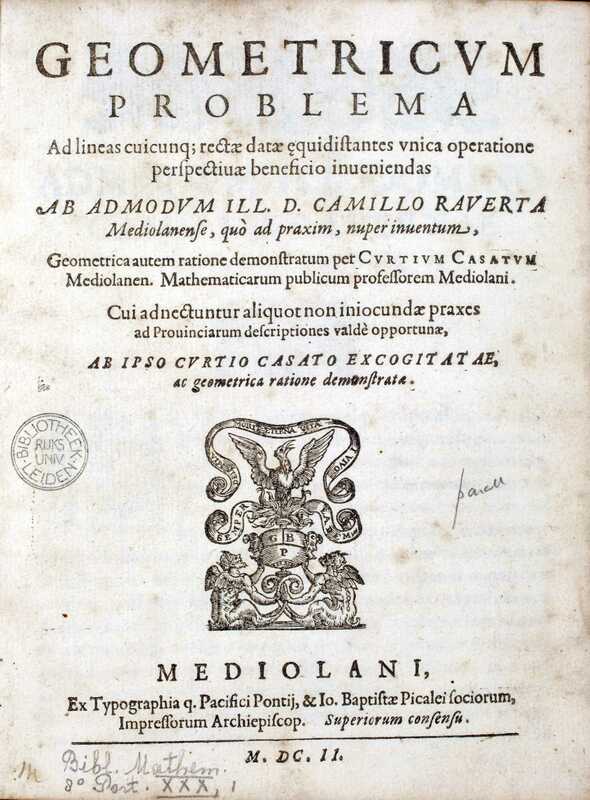 The oldest publication is a work by the Italian mathematician Camillo Raverta (1547-1604): Geometricum Problema (Milan 1602). The Leiden copy is the only one in the Netherlands.